ICH Blog: Can you help identify this mystery polar bear from Labrador? 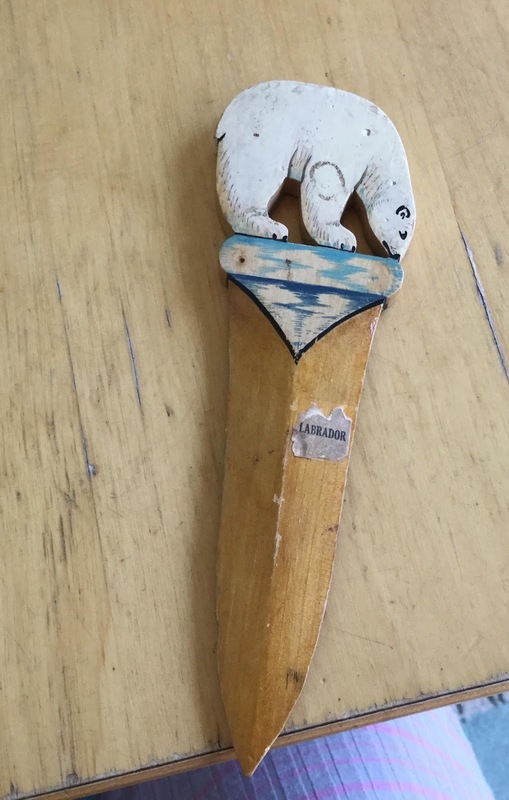 Can you help identify this mystery polar bear from Labrador? I am wondering about the history of a wooden letter opener that belonged to my great aunt. I have had it for many decades, and love it, but only recently found myself curious as to where my little bear came from. When I looked closely this morning, I saw a bit of a tag that reads “Labrador,” which finally led me to you. Does this craft piece ring any bells? I have fun finding out the background of family artifacts, where they came from, who the craftspeople might have been, what era they were created. This one seems to be from up in your neck of the world! If you can direct me to any pertinent resources, I would be appreciative. Would Pete barrett of Mealy Mountain Gallery know? She’s very knowledgeable in Labrador made crafts. If not, John Nevill of Black Tickle may have an idea. He’s the best carver I’ve ever met and may know who’s work this is.